Earlier in the year Sony released the 4.50 update for the system software of your PS4 . With the arrival of this new version it was also one of the functions most requested by users: to be able to add an external disk to the PS4 in which to store games , games or applications. So it will be necessary to have this update installed to use an external drive on your PlayStation 4. However, this function has certain conditions since you will not use any disc you have at home. The external drive for your PS4 PRO must have a minimum capacity of 250 GB and a maximum of 8 TB , as well as having USB 3.0 or higher connectivity. Luckily, most of today’s external units are in full compliance with these requirements, so you will not have problems connecting an external unit you just bought. If instead you want to recycle an old disk that you have forgotten in a drawer , you should take them into account and confirm that the hard disk does not have bad sectors or other failures, in addition to using a USB 3.0 box for external drives . Otherwise, your PS4 will not recognize it as such and you will not be able to store your games and console content on an external disk for not offering enough data transfer rate. Then, you only have to connect the external disk directly to the USB 3.0 connector of your PS4 to configure it, avoiding using adapters or HUBs. Once connected the external unit to your PlayStation 4 PRO , you must format it to use the same file system that uses its internal storage and streamline the management between the internal disk files and those of the external disk. To do this, access the Settings menu from the home screen of your PS4 and enter the Devices section . Next, choose the option USB Storage Devices , select the external drive you have connected and choose the option Format as expanded storage in the side panel. From that moment you can install games on your PS4 PRO on the external disk by configuring them from the Storage section of the Settings menu of your PlayStation 4 PRO. 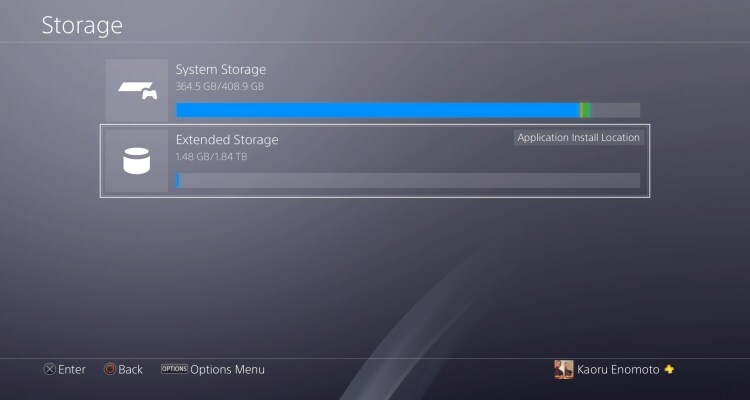 The use of an expanded storage system on your PS4 is very useful, but it also has some limitations of use, such as the fact that you can only use an extended storage system on your PS4 , even if you have several configured and formatted for it. For this reason, it is important to disconnect them safely to avoid deleting or damaging your saved games or corrupting the information they contain. To do so, go to the section Sound / devices and choose the option Stop using extended storage in the quick menu. As an alternative method, you can also do so by accessing Settings from the start menu of your PS4 and choose Devices , then select the option USB storage devices . Here, choose the external disk you have connected and select the option Stop using this extended storage. By performing this process you can disconnect the external storage safely and change it for another or simply leave it disconnected without losing any data.